David J. Ulbrich received his doctorate in history from Temple University in 2007. 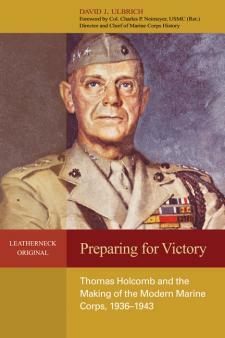 The Naval Institute Press recently published his first book, Preparing for Victory: Thomas Holcomb and the Making of the Marine Corps, 1936-1943. This book won the 2012 General Wallace M. Greene Jr. Prize for the outstanding book on Marine Corps history, and it also received an honorable mention for the 2012 Rear Admiral Samuel Eliot Morison Award for Naval Literature. Ulbrich has served as historical consultant and on-air segment host for the award-winning Echoes of War: Stories from the Big Red One television documentary and as co-director of the Cantigny First Division Oral History Project. Both these projects were funded by the McCormick Foundation. Ulbrich has lectured at the National World War II Museum, Army War College, Naval War College, Temple University, Delaware Military Heritage and Education Center, and Brookdale Community College’s Center for the Study of World War II. He is currently command historian at the U.S. Army Engineer School at Fort Leonard Wood in Missouri, and senior instructor in Masters in Military History online program at Norwich University. Apart from his duties with the Army, Ulbrich is completing the manuscripts for two co-authored textbooks: Ways of War: American Military History from the Colonial Period to the 21stCentury; and Amphibious Warfare: An Interpretative History. David G. Stroebel, in his first book, The Cannon King's Daughter, tells the fascinating story of how Alfred Krupp, head of the powerful Krupp Dynasty, managed to suppress the very existence of his rebellious daughter Engelbertha, shipped her to America, and "wiped the records of her birth" from German documents and Church records. William Manchester, in his Pulitzer Prize winning book missed this critical fact. Stroebel's dislosure of Engelbertha is likely to have some interesting consequences when German scholars and historians hear the full story. Stroebel will also tell us about the history of the Krupp Dynasty and the part it played in both World War I and World War II. The lecture will be videotaped and sent to Germany where we are informed some German scholars eagerly await it. In his April 4, 2013 review, Cmdr. Aboul-Enein sums up John McLaughlin's book on Wedemeyer as "...an excellent read." As Aboul-Enein notes, McLaughlin presents a Wedemeyer as both perceptive eye-witness to history and brilliant military strategist against a "... backdrop of inter-allied politics, pro-isolationist domestic political pressures..."
Not one to rest on his laurels, McLaughlin's newest project will find him in the classroom this fall, at the South Orange/Maplewood Adult School where he will be teaching a course about the China-Burma-India theater in World War II.